Rail technology leader Bombardier Transportation has won a GOOD DESIGN™ Award for its BOMBARDIER INNOVIA Monorail 300 system. This driverless transit system is designed on the principles of iconic aesthetics, mass transit capacity and fast-to-build infrastructure. The INNOVIA Monorail 300 vehicle's sleek, aerodynamically styled exterior design has attracted the attention of developers, politicians and the public like no other. The focus on design continues inside; spacious interiors with flexible seating arrangements provide high capacity mass transit capability and open gangways allow passengers to walk through the cars to enhance passenger flow, comfort and safety. System infrastructure is architecturally designed to integrate seamlessly into urban environments with slender, contemporary guidebeams that direct the vehicles and provide structural support. 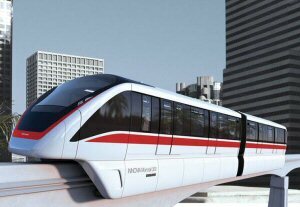 Bombardier is currently delivering two INNOVIA Monorail 300 systems. In Saudi Arabia, a 3.6 km system with six stations and six two-car monorail trains will be the primary mode of transport for the prestigious new King Abdullah Financial District. In Brazil, the addition of the new 24 km line, with 17 stations and 54 seven-car trains, will enhance the city of São Paulo and substantially reduce travel times for up to half-a-million people every day. Pierre Attendu, President, Systems Division, Bombardier Transportation, said, "Bombardier's award winning INNOVIA Monorail 300 system combines excellence in product design with innovative technologies such as the Permanent Magnet Motor and the BOMBARDIER CITYFLO 650 train control system for driverless operation. INNOVIA Monorail 300 is a truly game-changing solution for city and airport authorities requiring an attractive, cost-effective and fast-to-build mass transit solution." Founded in 1950, the Chicago Athenaem: Museum of Architecture and Design's GOOD DESIGN Award is the oldest and most recognised program for design excellence worldwide. The emphasis of the GOOD DESIGN program is on quality design of the highest form, function, and aesthetic standards. Bombardier Transportation, a global leader in rail technology, offers the broadest portfolio in the rail industry and delivers innovative products and services that set new standards in sustainable mobility. BOMBARDIER ECO4 technologies - built on the four cornerstones of energy, efficiency, economy and ecology - conserve energy, protect the environment and help to improve total train performance for operators and passengers. Bombardier Transportation is headquartered in Berlin, Germany, and has a very diverse customer base with products or services in more than 60 countries. It has an installed base of over 100,000 vehicles worldwide. Bombardier is the world's only manufacturer of both planes and trains. Looking far ahead while delivering today, Bombardier is evolving mobility worldwide by answering the call for more efficient, sustainable and enjoyable transportation everywhere. Our vehicles, services and, most of all, our employees are what make us a global leader in transportation. Bombardier is headquartered in Montréal, Canada. Our shares are traded on the Toronto Stock Exchange (BBD) and we are listed on the Dow Jones Sustainability World and North America Indices. In the fiscal year ended December 31, 2013, we posted revenues of $18.2 billion. News and information are available at bombardier.com or follow us on Twitter @Bombardier. For news releases, related material and photos, visit our media centre at www.bombardier.com/en/media-centre.html. Follow Bombardier Transportation on Twitter @BombardierRail. BOMBARDIER, INNOVIA, CITYFLO and ECO4 are trademarks of Bombardier Inc. or its subsidiaries. GOOD DESIGN is a trademark of The Chicago Athenaeum: Museum of Architecture and Design. To view the photo associated with this press release, please visit the following link: http://media3.marketwire.com/docs/BOMBARDIER_INNOVIA_Monorail_300_System.jpg.